How do I carry out automatic processing? To carry out automatic analysis, select Start automatic processing at the Import Data stage. The Start automatic processing selection button at the Import Data stage. The first screen that appears when you launch automatic processing via the Start automatic processing button. You are then taken through a wizard which allows you to set up and launch the analysis. The options in the majority of the wizard pages are actually the same as those available in the corresponding sections of the step-by-step workflow, and are described in more detail in existing FAQs, which are linked to from the relevant sections below. 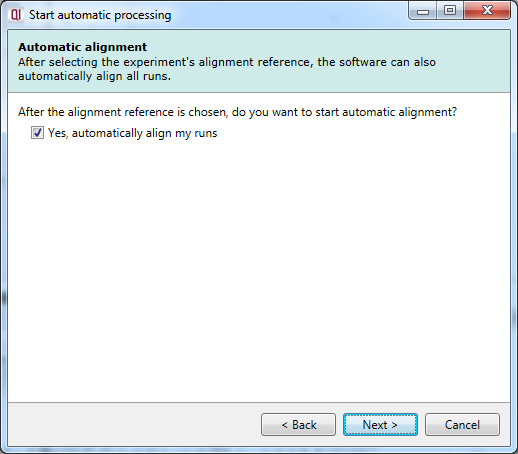 This dialog specifies which run is to be used as a reference run for alignment. Once imported, the most suitable run can be automatically determined from all, or a selection of, runs. Alternatively, you can specify an individual run up front. Our online guidance can help you determine the best option for your data. 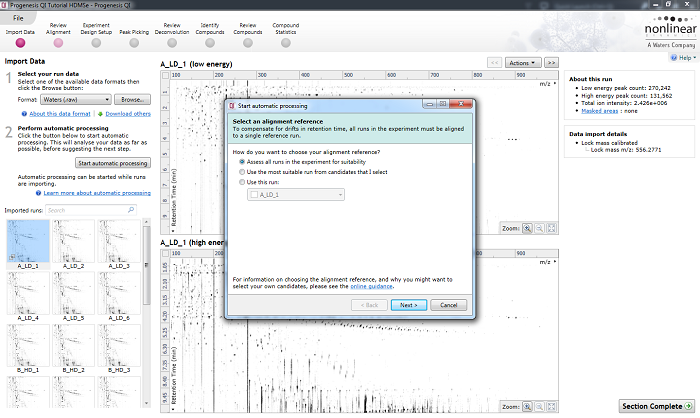 The Select an alignment reference dialog, the first stage of automatic analysis setup. 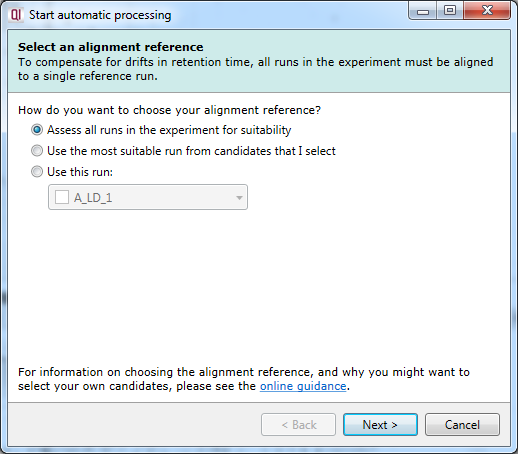 Having selected an alignment reference at the previous step, you can now opt to perform auto-alignment. If you choose not to automatically align your runs, no further automatic processing can be performed beyond the alignment reference selection. The Automatic alignment selection dialog. 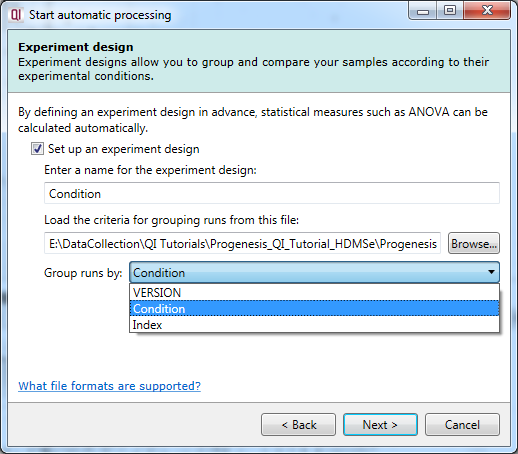 In this dialog, you can import an existing experiment design to speed up the comparison of your samples once quantitated. You will need a file containing your samples and conditions, using the import experiment design format. 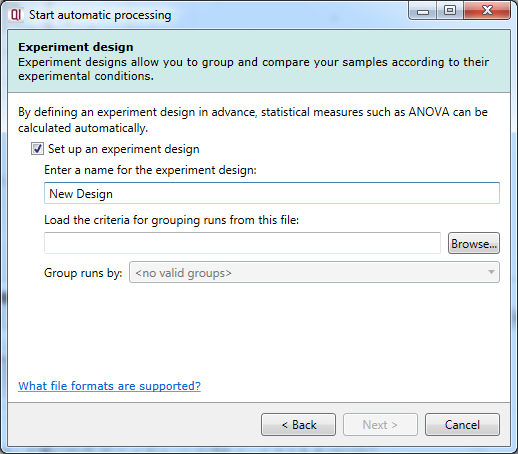 Once a suitable file is loaded, you will be able to select from the grouping variables present in your table as to which provides the initial experiment design. This can be achieved using the drop-down provided in the dialog, as shown below. A successfully loaded .spl file allowing selection of the initial experimental design from all the grouping variables present within the file. This dialog allows you to select whether to carry out compound ion detection as part of the automatic processing. You can also customise the compound ion detection (as can be done in the normal workflow at Peak Picking) using the Set parameters button. 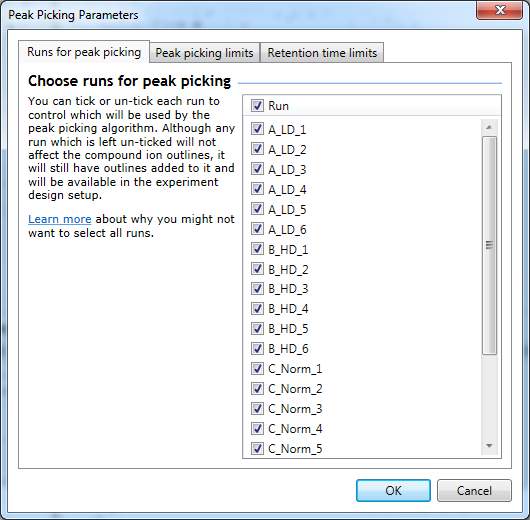 You can select the runs used in picking at the Runs for peak picking tab, customise the detection parameters as desired at the Peak picking limits tab, and / or exclude retention time regions of the profile at the Retention time limits tab. The peak picking dialog with the Set parameters button highlighted. The Peak Picking Parameters accessed using the Set parameters button, as described in the text. This is the final selection dialog; after this, selecting Finish will begin the analysis. The automatic processing workflow will provide an ongoing progress report once running, ticking each item as it is completed with summary comments and updating you on percentage progress towards completion of the whole process. 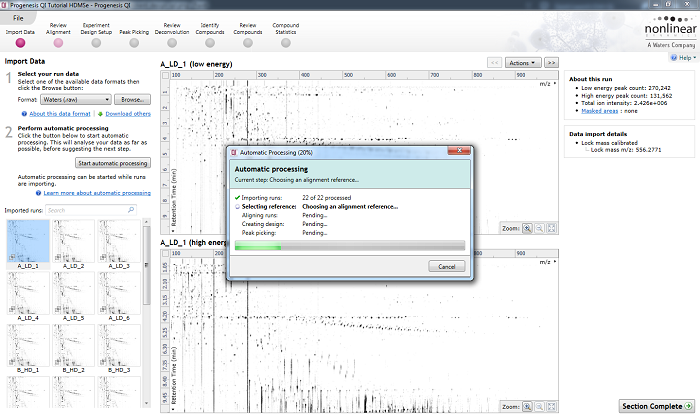 The automatic processing status dialog, showing progress of the analysis. Once the process is complete, the dialog can be closed, and you can move to any stage of the workflow as appropriate. All the selected stages will have been completed for you; you may either review the automatic analysis results, or jump to the first uncompleted stage, as desired. 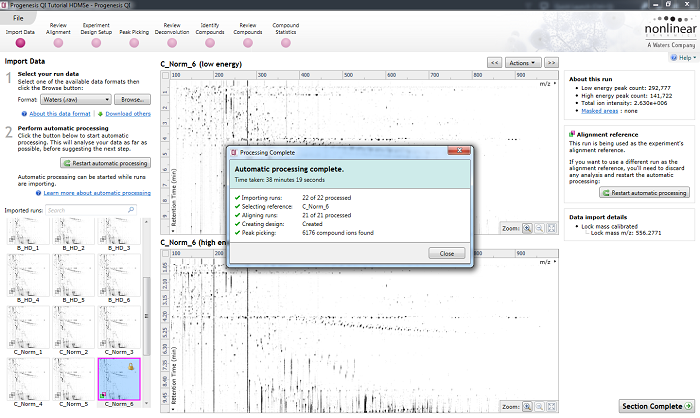 The automatic processing status dialog reporting a completed analysis. If a stage fails to complete successfully or only partially completes, the automatic processing dialog will warn you of the problem. This may or may not prevent the automatic processing as a whole from completing. For example, a run that fails to automatically align will trigger a warning, although analysis will continue. That run will not contribute to the peak picking and will be excluded at the alignment stage, but can be added back in at the Review Alignment stage if desired once its alignment has been corrected. Runs that import successfully, but with warnings flagged up, will be identified by the automatic processing dialog to notify you of the potential quality issue. They can be investigated on the Import Data screen. If some runs fail to import (but not all), the automatic processing will continue without those runs. Naturally, if all runs cannot be imported, owing to a problem with the data, then automatic processing would not proceed. Another problem that would halt the automatic processing could occur if you select only a subset of runs to be considered for the alignment reference, and do this before they have all imported. If it then came to pass that all of the reference run candidates had problems that prevented their import, then the software would not be able to set a reference, and processing would cease.